What is the Most Convenient Way for Touring Washington DC with Elderly Visitors? So, your parents are in town and they have limited mobility. How are you going to get them to all the memorials? Have you considered a private pedicab tour? It is by far the best way for elderly visitors or those with limited mobility to get quickly, safely and conveniently to all the memorials. 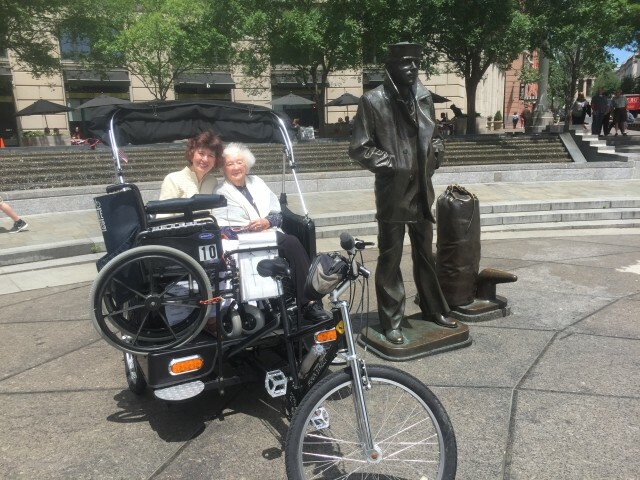 Why Elderly Visitors to Washington DC Should Consider a Pedicab Tour? So, the problem is that the memorials are quite spread out. There are 8 major memorials plus the White House and the US Capitol. You are looking at 7 miles of walking o see all of that on foot. You might drive to each memorial, but then you have a parking problem. The double decker bus doesn’t stop so close to each memorial, and they make you wait each time you want to get back on the bus. With a pedicab tour, all these problems magically disappear. We take care of all the details, so all you have to do is simply enjoy the tour. You will never get this level of personalized service and one-on-way interaction with your guide on a bus tour. 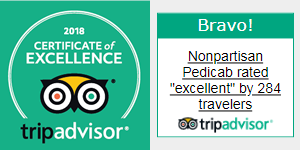 Give you a fantastic one-on-one personalized tour — take a look at our Fantastic Reviews! Go at your own pace — take your time or go quickly. It’s up to you. We won’t ever rush you. A handrail and a step for easy entrance and exit from the pedicab. It is easy to get in and out of the pedicab for those with limited mobility. A sun roof in case of strong sunshine, and a canopy in case of rain. In the cooler seasons, we carry a blanket to cover your legs. Who Will Be Your Tour Guide? This is a personalized tour. We will give you an detailed description of the national monuments and the grand buildings of the city. We also give you an overview of how this all fits into American history. You get American history, the history of Washington DC, a history of each memorial, and insights into the daily functioning of the city. We also know a great deal about current things going on in town, and we have plenty of recommendations on things to do and some really great restaurants. Most of our guests say that their pedicab tour was a highlight of their visit to Washington DC. We are going to make this special, just for you. Please check out our reviews! 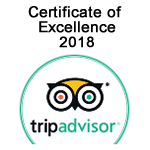 There’s a good reason that we are ranked #2 of all tours in Washington DC by Tripadvisor. I’m Sold! How Do I Book the Tour? Well, the easiest way is to pick up the phone and give us a call at 703-231-9882. We will happily answer any specific questions you might have. Or, just click on our Reservations page and fill out the easy form. We also have a Contact Page where you can send us a message if you want some more information but you’re not yet ready to make a reservation. Finally, you can just email us at [email protected]. We promise to get back to you quickly. 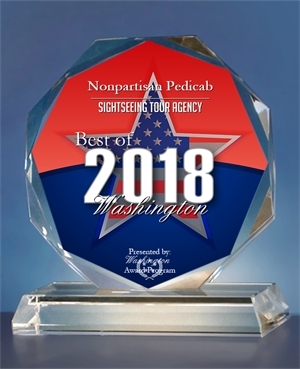 Our page, What to See in Washington DC is full of insider tips on all the must-see places to see while visiting the nation’s capital. We also have a handy guide Washington DC Tours for Handicapped and Disabled Visitors. The National Park Service has a planning guide to the National Mall. And the AARP has a few pointers as well.